Many of the historic English coins that will be displayed at the February 22-24, 2018 Long Beach Expo (www.LongBeachExpo.com) in the upcoming inaugural exhibit of rarities from the privately owned Tyrant Collection are so rare that normally they may be seen only in European museums. Some of the coins in the “Tyrants of the Thames” exhibit have never before been publicly displayed in the United States. 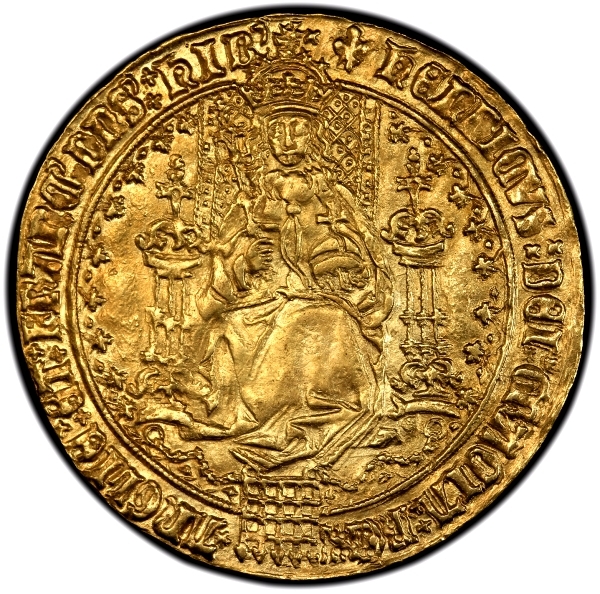 Henry VIII Sovereign: A gold sovereign of King Henry VIII, issued 1526-1544 and the largest coin of his turbulent reign, is one of the great treasures in the Tyrants of the Thames” exhibit at the February 22-24, 2018 Long Beach Expo. Near the end of King George III’s long reign, a series of new denominations emerged, called the New Coinage. 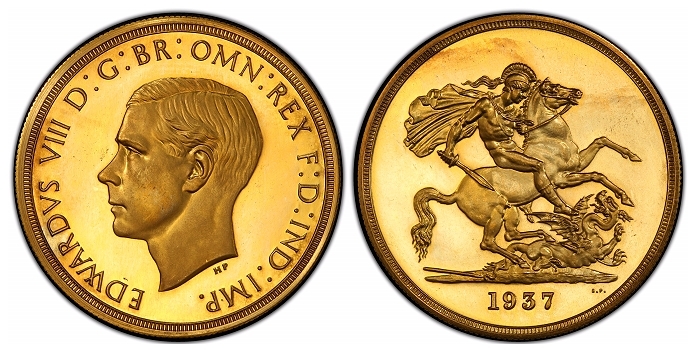 The largest gold issues were the 5 pounds, replacing the earlier 5 guineas coins. One of the great rarities of this series is the 1820 pattern, engraved by Benedetto Pistrucci and struck at the then-new Tower Hill Mint in London, and a lovely example appears in the Tyrant Collection display. George IV’s large gold proof of 1826 in this collection is a superb piece, as are two examples of the young Queen Victoria’s famous Una & the Lion issue. Her 1887 Jubilee Head and 1893 Veiled Head 5 pound coins are also shown in superb Proof conditions. 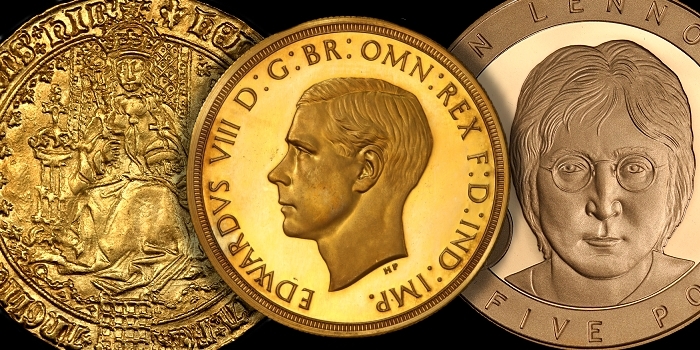 Edward VIII 1937 proof 5 Pounds – The only complete 1937 Edward VIII proof set in private hands will be displayed for the first time in the United States as part of the Tyrants of the Thames exhibit at the February 2018 Long Beach Expo. This coin from the historic set is the gold proof 5 pounds. 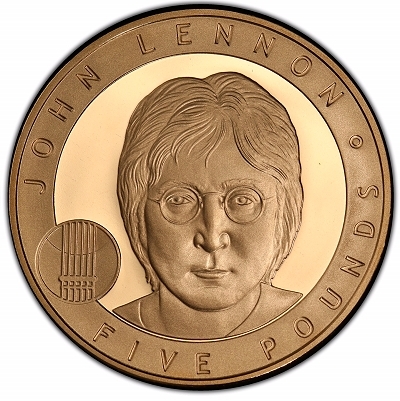 The other great rarity of this reign in the collection is a unique 5 pound gold proof dated 2010 which shows the queen’s portrait on one side and a facing image of the famous musician John Lennon on the other side. This coin was made by The Royal Mint for collectors in silver. A single piece was struck in gold as a present for Lennon’s widow, Yoko Ono, who auctioned it and donated the proceeds to charity. It is now part of the Tyrant Collection and will be on view in this special exhibit. 2010 John Lennon – A unique 2010 gold 5 pound coin depicting Queen Elizabeth II and musician John Lennon was given to Lennon’s widow, Yoko Ono, who subsequently donated it to an auction to benefit a children’s hospital in Liverpool, England. It will be displayed for the first time in the United States at the February 2018 Long Beach Expo. Photo credit: Professional Coin Grading Service.